If you want to hunt for targets or treasure on the beach or if you have a highly mineralized backyard, then you will find the Ace 350 Garret Metal Detector highly useful. This metal detector is designed with mineralized ground and saltwater hunts in mind. To manage these conditions, the detector is fitted with a special coil which can withstand salt water. There are many other features that have resulted in this metal detector being placed highly in the list of the best metal detectors. Most of the people who have used his detector have a lot of positive feedback and the following features are why. Modes – Most metal detecting adventures involve the search for a wide variety of treasures. This means that you will be better off with a detector that allows you to find different targets. The Ace 350 Garrett Metal Detector is designed to give you options and you can choose a default discrimination pattern that fits your hunt. You can select from 5 modes depending on whether you are hunting coins, relics or jewelry. You also get a chance to customize your own settings which will go a long way in assisting you find your targets fast and easy. If you are looking for tiny targets, the zero and pinpoint modes will come in handy. Advanced Iron Detection – If you have ever hunted using a metal detector, then you understand why picking up iron in junk is an issue. A lot of time is wasted when junk is detected. Metal detectors are designed to help you find metallic items and the basic detector will not differentiate between trash and the good targets. For this reason, the Ace 350 Garrett Metal Detector has been fitted with the latest technology which will help you in saving time. This technology differentiates between treasure and useless items and saves you the time and energy you might use digging up for trash. Depth Detector – When you are hunting for targets buried in the ground, knowing how deep they are is very important. No one wants the metal detector to detect something then they start digging without knowing how far the item is. There is no time for guess work especially with the modern metal detectors. With the Ace 350 Garrett Metal Detector, you get the continuous coin depth indicator technology which will give you an estimate of how far the item is. One of the reasons why the Ace 350 Garrett Metal Detector has become a popular meal detector is because it performs exceptionally well on mineralized grounds and saltwater. The manufacturer ensured that the detector has a special coil. The PROformance DD coil has a blunted tail and tip and a better depth detection which counters the interference presented by mineralized grounds and saline water. This means that you can comfortably search on the beach, in the ocean and on grounds full of metals and minerals. Most of the things you will find in your hunting adventures are tiny such as jewelry, rings, coins, bullets among others. You will find the Ace 350 Garrett Metal Detector quite useful because it has a high frequency which allows it to detect tiny targets. This is another reason why this metal detector has been ranked higher than most products with lower frequencies. When you are hunting for treasure, the higher the frequency, the better your find will be. With most metal detectors, you will be required to purchase your own headphones. The advantage of having headphones when hunting for treasure is that you will have a better experience since you will be getting clear sound triggered by the targets. 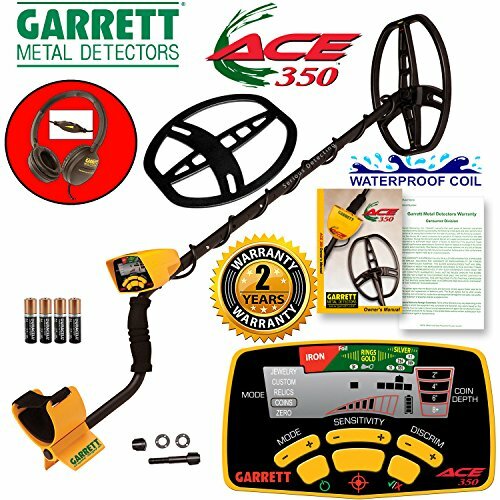 The Ace 350 Garrett Metal Detector comes with headphones and this will help you start saving money that would otherwise be spent on buying headphones separately. In addition to the above features the Ace 350 Garrett Metal Detector comes with ground balance monitor with customizable settings which lets you set the detector for the target location. The device has a large LCD display that features readout ability and a touchpad control displaying details such as sensitivity and target’s depth. This device has an inbuilt speaker though it comes with headphones in case you want to listen closely. This is a powerful device but there are a few complains on false signals on the beach. To solve this, you can just set the frequency a little bit lower. A part from this, the Ace 350 Garrett Metal Detector is designed to provide precision and accuracy when hunting for treasure on the mineralized grounds and salty water. With its many great special features, the Ace 350 Garrett Metal Detector is inexpensive and one of the best metal detectors to consider when shopping for this product. How to Choose a Metal Detector That Works for Me? Metaldetectorjudge.com is a participant in the Amazon Services LLC Associates Program, an affiliate advertising program designed to provide a means for sites to earn advertising fees by advertising and linking to amazon.com.